Train accident in Amritsar: Railway authorities said they were given no prior notice or information about Dussehra celebrations being conducted near the tracks. 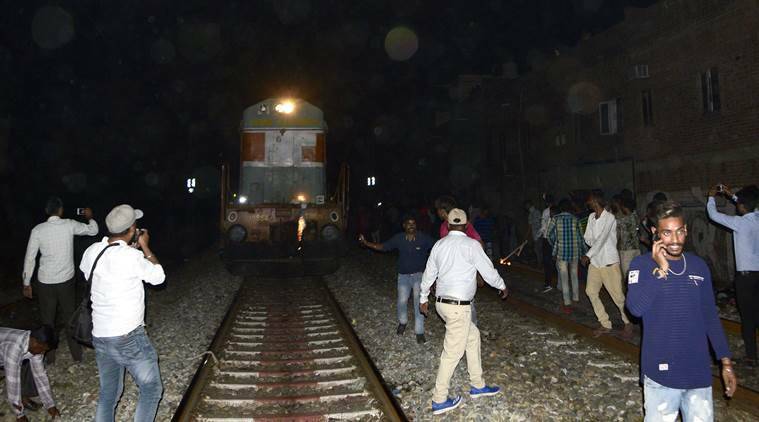 As officials of the Railways took stock of the Amritsar incident and Minister of State (Railways) Manoj Sinha headed to the site Friday night, top sources in the Railways said preliminary reports suggested that the mishap could have been averted or, at least the number of casualties could have been fewer, had local railway officials responded to the obstruction on the tracks created by the presence of a huge crowd. But in Amritsar, railway authorities said they were given no prior notice or information about Dussehra celebrations being conducted near the tracks. Sources said no “temporary caution order” was issued by the local railway administration — the incident site falls under Ferozepur division of Northern Railway — to alert drivers to slow down at certain sections owing to possible obstruction on the tracks given that the effigy of Ravan was being burnt at a site. The two trains, sources said, crossed the section at high speed. Railways officials said there was no intimation from state authorities about the Dussehra function at the grounds near the tracks. Sources said the drivers of the Diesel Multiple Unit (DMU) local train, headed to Amritsar from the Jalandhar end, and the Amritsar Howrah Mail, which had moved out from Amritsar, did not apply emergency brakes though the Dussehra fireworks would have illuminated the tracks, making the crowd visible from considerable distance. Both trains reached their respective next stations. Moreover, the incident happened some 200 metres from an interlocked level crossing. For the trains to receive green signals, the gate would need to be closed, which it was, sources said. The gateman, instead of lowering the gate, which translates into an “all clear” green signal, should have communicated to the nearest station about the large assembly of people right next to the tracks ahead and advised the station staff accordingly about the movement of the trains, sources said. “Train officials are not at fault, the down signals for the crossing were given and the gates at Jaura crossing were closed, so the train was going at its normal speed. People watching the Dussehra celebrations should have not have been standing on the train tracks,” he said. Mehrotra said according to his information, when the effigy began burning, people got on to the tracks without keeping a lookout for the approaching train, and remained focused on the Ravan effigy. “I think people got confused as there were two trains that crossed the point at the same time,” he said. He blamed the Dussehra event organising committee for conducting the function near the tracks without informing the railway authorities. “They should have at least given me a notice or letter about the event. Had we known about it, we could have asked the driver to be careful near the event area. It is not the fault of the driver. When he sees the gates are closed and the signal is down, he will act accordingly because he is confident that the track is OK,” Mehrotra said. In New Delhi, sources said the Commissioner of Railway Safety (CRS) may look into all these points to fix responsibility. The role of the civil administration too could be under scrutiny because securing and barricading the area is its responsibility. Railway Minister Piyush Goyal, who was in the United States, tweeted that he was cancelling all his engagements and heading home. “May God give strength to the bereaved and injured. Railways is proving all possible assistance at the site. I have cancelled all engagements in USA and immediately returning back to India,” he tweeted. Northern Railway spokesman Deepak Kumar maintained that the line was clear but people spilled on to the tracks as the firecrackers went off once the effigy of Ravan was set ablaze.